A centrally located duplex-apartment. Beside the historical centre, it is an exciting choice for visiting the busy Barcelona, without giving up the rest. The stylish flat comes with all modern comforts including a modernised bathroom and fully equipped kitchen. High ceilings and three large windows allowing for a lot of natural light accentuate the open feel of the flat. A calm colour scheme is followed through in every room adding to the overall, pleasant atmosphere and sleek look. The main floor includes a separate bedroom and a large, open space. This floor is conveniently sectioned into dining and relaxation areas with an open kitchen allowing guests the choice of socializing around shared activities or retreating to private quarters. The charming mezzanine has sleeping arrangements for four, plus a very comfortable hand-made Masaya-hammock to stretch-out between any of the numerous Barcelona goings-on that might leave visitors needing a small time-out. Barcelona Plaça de Cataluña - 24 min. T2 Aerobus - 50 min. 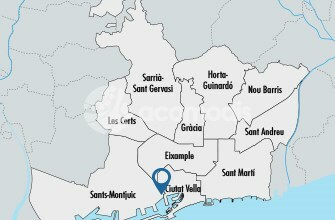 From AP-7/France >> C-33>> C-58>>B10 -Ronda del Litoral>>take exit 21 toward Ciutat Vella, Paral•lel, La Rambla, Montjuïc, Port Vell and see detailed map of the booking confirmation. The flat is located in the quiet, residential area of Poble Sec, at the foot of Montjuïc. Guests have the privilege of strolling in the parks of the Montjüic area (including the Olímpic Parc, the Jardí Botànic and the Jardins del Teatre Grec (Gardens of the Greek Theatre - , etc). or taking advantage of the close proximity to the centre of the city. By Metro (100 m.), it is only one stop to the famous Las Ramblas, the focal point, and main meeting place in Barcelona. In this location, guests are close to the shopping areas, the major sites and museums of central Barcelona. For local shopping, all everyday requirements (convenience stores, pharmacies, bakeries, etc.) are at hand, and the market Mercat de Sant Antoni is only a few blocks away. Close by the square of Plaça Espanya, a transport hub and a gateway to commercial fairs and several cultural institutions: Museu Nacional d’Art de Catalunya, the Museu Fundació Joan Miró, etc.. The flat is an excellent “headquarters” for roaming the city and its surroundings. Visitors whose ideal stay in Barcelona includes a place centrally located in an authentic Barcelona area will be hard pressed to find a better alternative to our Poble Sec flat. The apartment is in a great location, with nice restaurants around and easy access anywhere (it's close to Paral.lel metro station). The hosts were very nice and reactive, and helped me solve some booking issues I had before the arrival. Thank you very much! A terrific experience for my family. A great appartment in a great location. Everyone enjoyed the stay and the personal service we received was a delight. El apartamento es acojedor y muy mono, buena situación.